This handcrafted stoneware kitchen caddy keeps your dish sponge and scrubber clean and dry. This stately stoneware caddy will leave your dish cleaning tools high and dry—and looking good. It keeps your sponge and dish scrubber oriented vertically and away from pooling water, allowing them to dry fully and reducing odor. Ceramicist Scarlett Pons forms the stoneware cylinder by hand on her potter's wheel before cutting its contours and adding an earthy cream glaze. The caddy is also dishwasher safe, so it's easy to keep it looking like new. Handmade in Fredericksburg, Virginia. Brushes and sponge not included. Scarlett Pons is a self-taught potter with a degree in architecture. After working seven years as a professional architect in NYC, she and her husband moved to Fredericksburg, Virginia, to start a family and their own retail business that would focus on handmade items. She designs, makes, and fires all her ceramic pieces in their country studio. Her home and garden pieces are simple and elegant, often described as "rustic contemporary." Scarlett's inspiration comes from modern architecture and home products from the Bauhaus era. I got really tired of struggling to clean the plastic sponge holders that attach by suction cups on the side of the sink; could never get all the mold off. 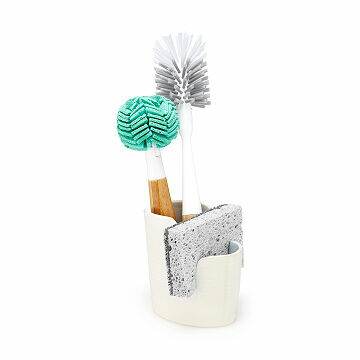 The sponge/brush holder works perfectly, is pretty, and is easy to clean. It's pretty and functional, but I wasn't sure why the area for the scrub brushes wasn't a separate section. The way it's designed is a little puzzling because the brushes tend to flop around a bit because there's nothing but the sponge to stop them from moving. A separate compartment for the brushes would make more sense. That being said, I still like the look of it and it definitely makes a difference with how long it takes the sponge to get stinky! I had never seen a stone/clay sponge holder before and immediately fell in love with it's design and simplicity. I'm one of those people that thinks that everyday items deserve to be not only well designed, but beautiful. Great product! Looks great by my sink and organizes sponge and dish brush. Beautiful and quality design. Wanted something other than a mason jar. This is excellent! This container is great - attractive and easy place to store sponge and brush so they don't drip on everything else.